Launched in 1999, the X5 is BMW's flagship mid-size SUV, or as BMW calls it, an SA — for Sport Activity Vehicle. From the very beginning, BMW worked hard to make sure that sporty driving dynamics and an elevated level of responsiveness were programmed into the X5. This means the X5 features not only a great deal of utility, but with BMW's all-wheel drive system, a sure-footed nature in a variety of terrains. Add to that BMW's trademarked build quality and luxury and the X5 is a versatile vehicle that's well-placed at the top of its class. Five trims are available, starting with the rear-wheel-drive sDrive35i and topping out with the X5 M.
The 3.0L inline 6-cylinder turbocharged engine in the sDrive35i and all-wheel drive xDrive35i makes 300 horsepower. The xDrive50i is fitted with an all-aluminum twin-turbo 4.4L V8 with variable valve timing and direct injection. It features what BMW calls a "reverse flow" setup, with its twin turbochargers situated within the valley between the cylinders. It makes 445 horsepower and 450 foot-pounds of torque. Powering the xDrive35d is a 255-horsepower 3.0L inline-6 diesel engine. The Variable TwinPower turbocharged engine also produces 425 foot-pounds of torque and delivers an EPA-estimated 26 mpg on the highway. The performance-oriented X5 M is in a class of its own with a twin-turbo 4.4L V8 that makes 567 hp and 553 lb-feet of torque. All the X5 models use an 8-speed automatic transmission. Brake energy regeneration is also used with the gasoline engines, which uncouples the alternator from the accessory drive system, allowing the battery to only be charged during coasting or braking. This, BMW says, results in up to 2 percent fuel economy boost. The standard safety features list includes driver and passenger front and side units as well as head airbags for the first- and second-row seats. BMW also offers Dynamic Stability Control, Dynamic Traction Control, Dynamic Brake Control, Hill Descent Control and Dynamic Cruise Control. Active Cruise Control and Lane Departure Warning systems are also available. There's also a rearview camera that can provide a 360-degree exterior view, a Heads-Up Display that projects onto the windshield in the driver's field of view and a Park Distance Control system that alerts the driver of obstacles behind the vehicle while parking. Three distinct lines are available. The Luxury Line includes 19-inch alloy wheels, chrome window surrounds and a sport leather steering wheel. The xLine features stainless steel underbody cladding front/rear, silver matte kidney grille, rocker panels and front air intakes, roof rails in Satin Aluminum as well as window trim made of the same material, unique 19-inch wheels and Anthracite headliner as standard. The M Sport package includes an M Sport steering wheel, a sport automatic transmission, sport seats and M-badged foot rests and door sills. 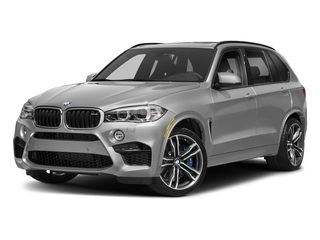 The X5 M is equipped similarly to the xDrive50i, but gets 21-inch wheels, auto-leveling suspension, driver-selectable adaptive suspension, a limited-slip differential and powerful M compound brakes. Unique sport seats with deep bolsters as well as a unique interior color are also included. BMW shuffled the X5's lineup a little bit for 2018, but the vehicle remains fundamentally unchanged. A transmission upgrade for 2018 should provide smoother and more responsive shifts. Trapezoidal tailpipes are now also standard for this year. BMW's X5 offers seating for seven with high-tech on- and off-road capabilities. With great styling as well as a host of refinements throughout its development, the package is hard to ignore. Although it ranks among the more expensive SUVs in its class, it's a strong competitor in the segment, offering a wide range of options not found on the Acura MDX, Lexus RX 350 and Mercedes GLS. The BMW offers intense performance for less money than others in its class without sacrificing comfort and capability both on- and off-road.